Back in May I mentioned that I was doing a small experiment with growing garlic in containers. This is a write up of the results of the experiment. A post for the garlic aficionado's I suspect! In my opinion, Garlic is the second easiest crop to grow, Sorrel being the first. I've always grown garlic in raised beds built up from the ground. I plant autumn-sowing garlic in Octover/November and generally harvest July/August. I also add some well-rotted manure on top of them, either straight away if the temperatures haven't yet gone below 10 degrees, or in Spring once the soil has warmed up a bit. Once the garlic has dried, I select the best bulbs to save for growing for the following season. The rest get eaten over the coming year. I know from past experience that garlic does need lots of light to grow. The stems/leaves need to get full sun throughout the period of growing in order to get the best from the crop. Two years ago I tried catch-cropping the garlic with Broad Beans. The garlic was ahead of the Broad beans to start with, but the beans soon caught up and eventually totally overwhelmed the garlic. The result was I ended up with very small bulbs. So I think catch cropping** would only work if you grow smaller crops with the garlic, such as corn salad or peas for pea shoots. These are low growing and shallow rooting, so they won't overwhelm the garlic stems and will allow them to get plenty of sun. The main maintenance task with garlic is watering. This is key during the peak growing period (approximately April-June) or during a dry Spring. Garlic grown in pots will dry out more than those in the ground, so therefore need more watering again. I also give them a feed of comfrey liquid a couple of times during April-June. If you are growing Hardneck Garlic (these are), then you also need to watch out for the garlic scrapes (right photo, the hook-like part of the garlic) coming up around May/June. These need to be cut off as soon as you see them, as otherwise all the energy is put into the scrape and you end up with tiny bulbs. On the plus side, the scrapes means you can make garlic scrape pesto. I've also use them as instead of garlic in a recipe, one scrape equaling one clove. If you are growing Softneck garlic, this isn't an issue. Although I tried growing garlic in pots in the past, I didn't look after the pots and they weren't always in full sun, so I ended up with small bulbs. 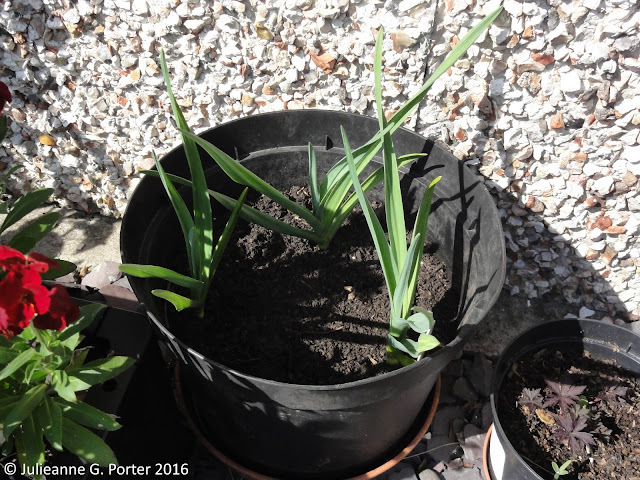 So this year I undertook an experiment to see how well you can grow garlic in pots. Using the variety 'Martin's Heirloom', I've planted: one clove in one pot, two cloves in the second pot, and three cloves in the third pot. In each case the pot size is the same, a 10 litre pot (283mm/11"). These were all sown on 10th January, about six weeks after I had sown the rest of the garlic direct to the ground. The reason for the delay is that I only decided in January to do the experiment! 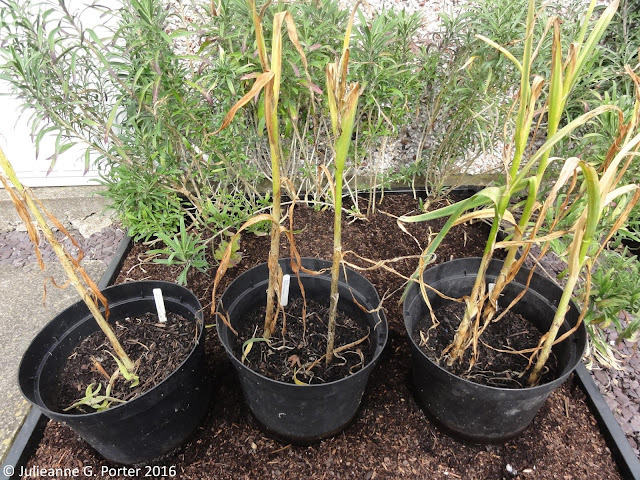 I wasn't sure whether sowing later would have that much of an impact on the growth of the garlic in the pots; I suspected the pot sown garlic would soon catch up to that which was sown direct. I harvested the garlic in pots on 4th September. I intentionally left them in slightly longer because they were sown later, though to be honest the garlic was looking ready to harvest a few weeks before. The photo above shows they were well and truly ready to be harvested. 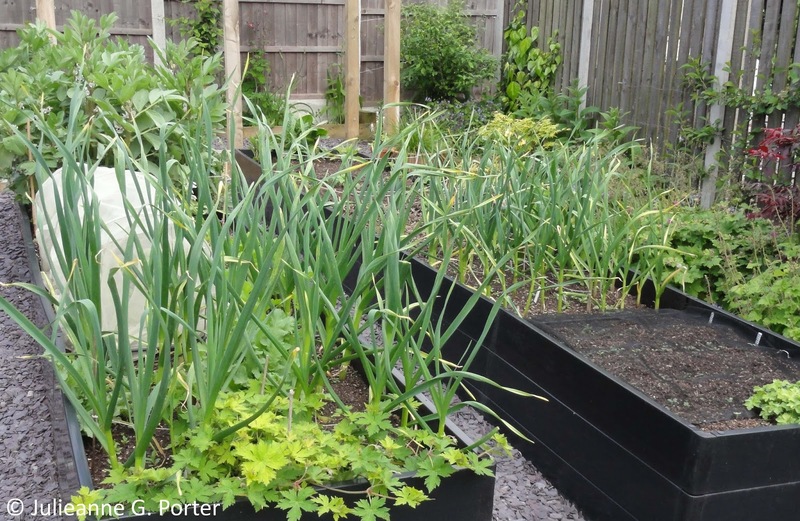 In the following photographs, the garlic on the right is one of the same variety grown in the ground (raised beds), and is for comparison with the pot-grown garlic on the left. Because I wanted to photograph them without soil so you could see the sizes better, the ones on the left have had their skins peeled back more, showing the internal colour of the garlic skin. Results from the pot with one clove. Pretty much the same size. Results from the pot with two cloves. One is similar to ground-grown garlic, the other smaller. the other 2 are smaller again. Of the three, I conclude that three cloves in a 10 litre pot will give you the equivalent of two-ish cloves grown in the ground. 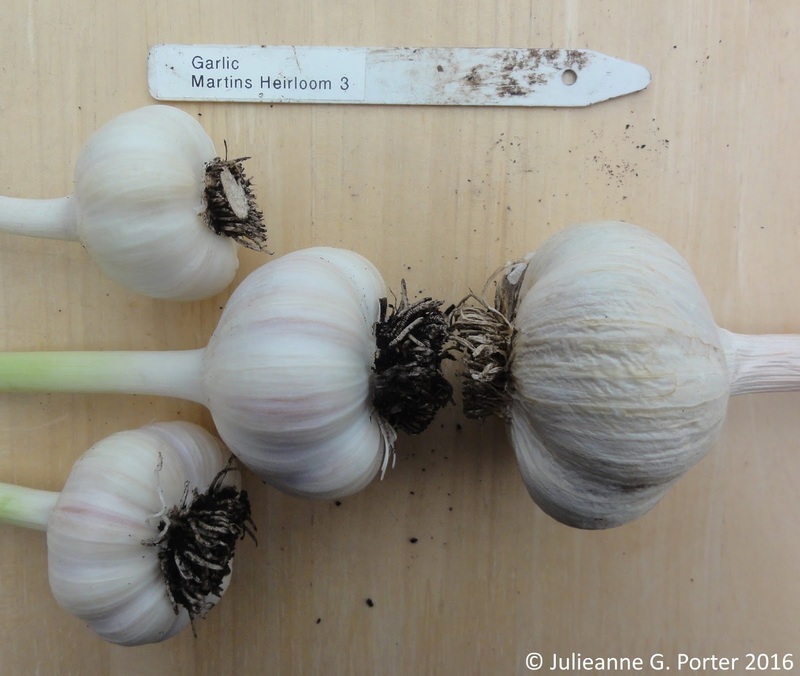 You get slightly more garlic, even if bulbs are smaller, from growing three in a pot compared to growing two in a pot. One final thought: this experiment has been undertaken using hardneck garlic. It is possible that growing softneck garlic in pots might give you different results. My plan is to widen the experiment slightly by growing two variety of garlic in pots next year. One of these will be Martin's Heirloom again, only this time I'll also add the catch-cropping of pea shoots or corn salad to the pot to see for myself if this has any negative impact. Growing garlic in pots is fairly easy, the main issues being that you need to water them more in dry weather, and accepting that you won't get as much garlic for your clove as you would growing them in the ground. If you really want to grow garlic and only have a small space, or like to grow in containers, then I think this is a good result. If you add in the catch-cropping of low growing crops like corn salad or pea shoots, then obviously you get even more for your pot. 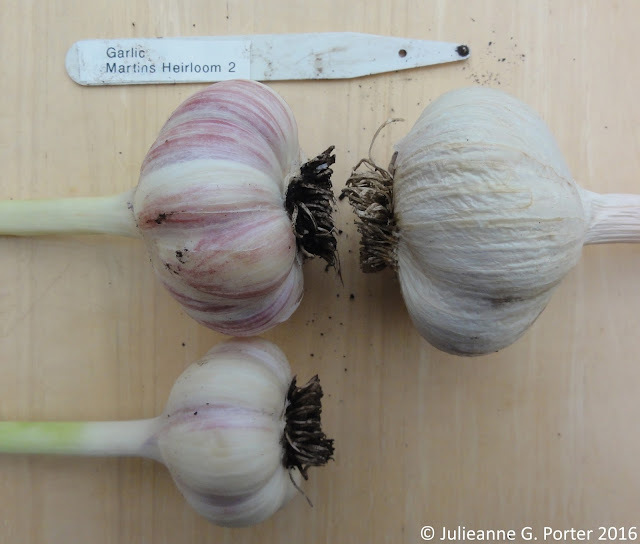 *I'll be going into a bit more detail about growing garlic and the differences between Hardneck and Softneck garlic, in my upcoming post on 'SpoonieVeg: Garlic'. 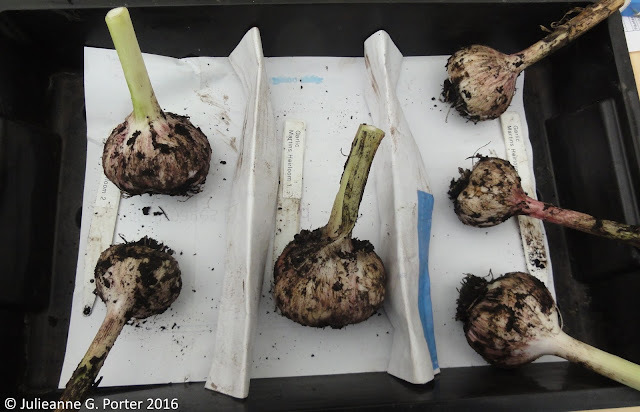 **I've never grown Spring-sown garlic, so cannot say whether the results of this experiment would be similar or not. Great experiment Gwenfar, the kinda thing I love to do :) How late you can grow autumn garlic depends on how much cold there is after you plant it out. Garlic needs a certain amount of cold to break its dormancy and form cloves of garlic instead of one huge clove. I usually grow spring garlic as I have a clay soil, so overwintering on wet ground can be tricky. Or I grow autumn garlic in 9cm pots over winter and plant out in the spring. 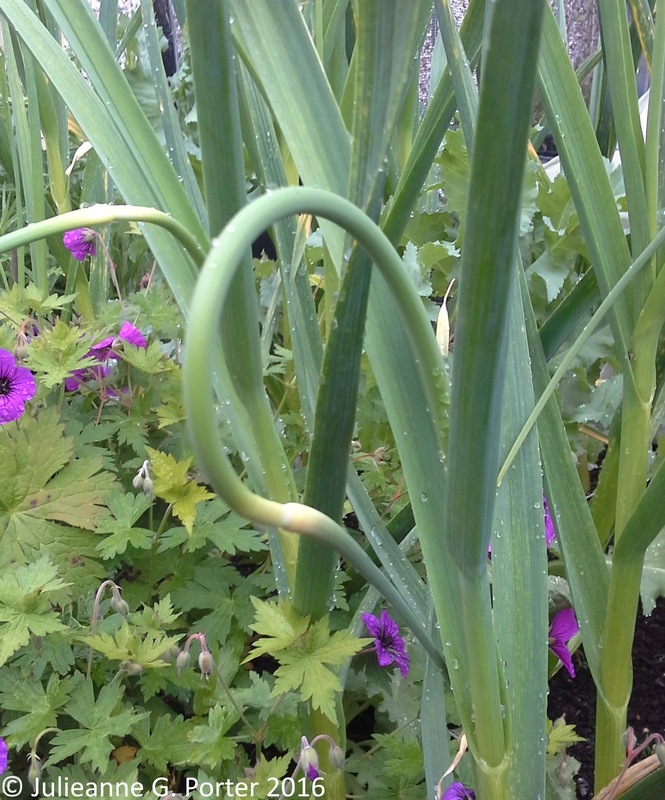 I've only grown garlic in pots to use up those fiddly small left over cloves to produce an early crop of wet garlic. 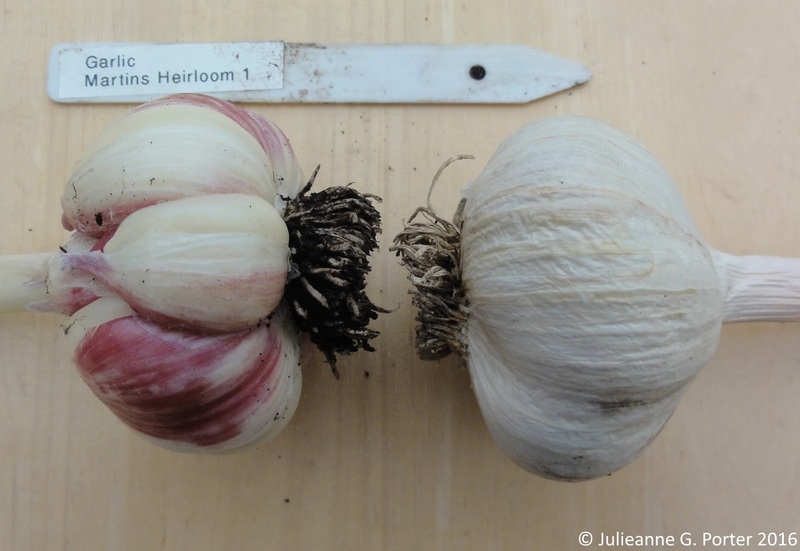 It's interesting to see a 'normal' sized clove results in a similar sized bulb to one grown in the ground. These are good points VP. 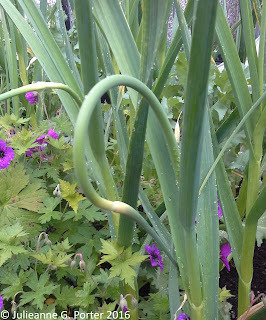 I was planning to discuss these in my future post on Spoonie Veg: Garlic (hopefully next week). I'll add a note about dormancy to this post though, as it's a very important point I missed! I have grown hardnecks in Oxford clay over winter, and most of them, including Martin's Heirloom, did quite well. But others, such as Susan Delafield, really suffered and I lost most of them. Shows how different varieties & types of garlic can be affected by the soil you have.